BOUNTY HUNTER PRINCESS! With HAN SOLO frozen in carbonite in the palace of JABBA THE HUTT, PRINCESS LEIA prepares for a daring rescue by taking on the identity of the bounty hunter BOUSHH. But in order to succeed, she’ll have to prove herself in her new identity to the ruthless bounty hunter BOSSK! 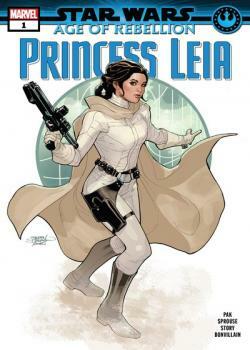 With her life and all of her principles on the line, how far will Leia go to rescue a scoundrel? Co-starring CHEWBACCA and LANDO, who almost certainly have a bad feeling about this!